You can quickly total data in an Excel table by enabling the Total Row option, and then use one of several functions that are provided in a drop-down list for each table column. The Total Row default selections use the SUBTOTAL function, which allow you to include or ignore hidden table rows, however you can also use other functions. Go to Table Tools > Design, and select the check box for Total Row. The Total Row is inserted at the bottom of your table. Note: If you apply formulas to a total row, then toggle the total row off and on, Excel will remember your formulas. In the previous example we had already applied the SUM function to the total row. When you apply a total row for the first time, the cells will be empty. You'll see that Excel created the following formula: =SUBTOTAL(109,[Midwest]). This is a SUBTOTAL function for SUM, and it is also a Structured Reference formula, which is exclusive to Excel tables. 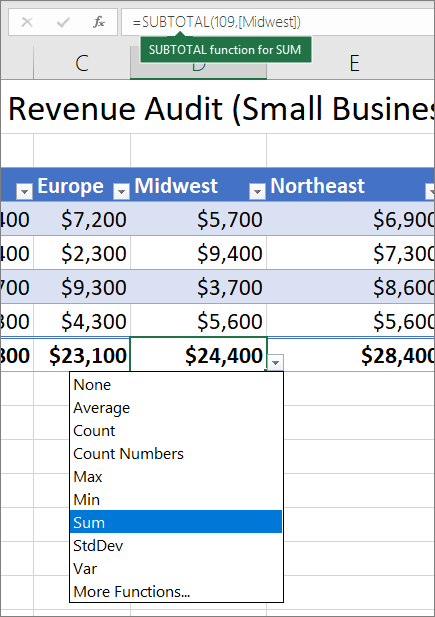 Learn more about Using structured references with Excel tables. You can also apply a different function to the total value, by selecting the More Functions option, or writing your own. Note: If you want to copy a total row formula to an adjacent cell in the total row, drag the formula across using the fill handle. This will update the column references accordingly and display the correct value. If you copy and paste a formula in the total row, it will not update the column references as you copy across, and will result in inaccurate values. Go to Table > Total Row. 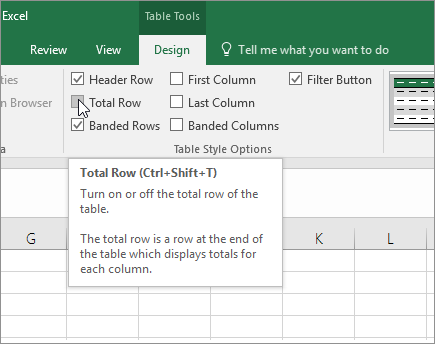 You can quickly total data in an Excel table by enabling the Toggle Total Row option. On the Home tab, click the down arrow next to Table, and select Toggle Total Row.